Pilates is a method of exercise created over 80 years ago by Joseph H. & Clara Pilates. Joe Pilates was born in Germany in 1880 and, as a young man, began a life-long study of health and physical fitness. Over many years of experimentation and implementation, Joe and Clara developed more than 600 exercises that they called the Art of Contrology, which today we call Pilates. The main focus of Pilates is the spine and the muscles directly related to the spine, which are your deepest core muscles. This process, when taught and performed correctly, will not only strengthen your core, but will also balance your body, and help you move through your daily life more proficiently. One of the greatest attributes of Pilates is that it’s based on natural movement and ranges of motion that directly translate to improvements in daily living! When most people think of Pilates, often their first thoughts are core strength, strong abs, 6 pack, and crunches. What they don’t realize is that the muscle that creates the ‘6 pack’ is big, thin, flat, and the farthest core muscle from your spine. This is called your rectus abdominis. This is NOT the muscle we are looking for in Pilates. In Pilates you want to work your transversus abdominis muscle. The transversus abdominis is the deepest of the abdominal muscles and is also a stabilizer of the spine. It runs horizontally between the ribcage and pelvis. Imagine a support belt like they wear at Lowes or Home Depot for heavy lifting. When properly developed, you’ve got your own internal support belt already “built in,” the transversus abdominis! 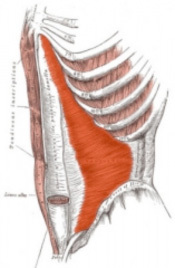 That’s your transverse abdominis in red below. Another important group of muscles we focus on in Pilates are the multifidi muscles. The multifidi are the deepest layer of muscles in the the back. They connect your vertabrae (the bones of the spine). Each multifidi connects 1-3 vertebrae, controlling movement between the vertebrae. How do you activate your multifidus muscles? Sit up tall; imagine pushing the ceiling away with the crown of your head. It is as simple as that. When we slump, we aren’t using the multifididus muscles. The transversus abdominis and the multifidi work together to support and stabilize the spine, helping prevent low back pain. As you deepen your connection to these key muscles you will literally begin strengthen your body from the inside out. This type of deep strength in the body goes underneath absolutely everything else that you do, whether it’s walking, running, Crossfit, yoga or simply sitting at your desk or carrying your groceries. Pilates directly translates into all movements that you make throughout the day.